Bed Bug Free supplies a range of high quality bed bug control services, ranging from visual and canine inspections to treatment and monitoring, to homes and business throughout Ohio including Cleveland, Akron, as well as the Greater Northeast and Greater Northwest areas. Since 2005 we have been completely licensed, certified, and insured to deliver our superior service experience. Bed Bug Free raises the bar on moral standards, family-friendly customer services, and superior execution on all services rendered. With the use of effective products and equipment exclusively offered to licensed professionals, Bed Bug Free ensures premium results to our valued customers. 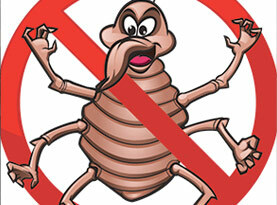 If you even suspect bed bugs, call Bed Bug Free today! Commercial and residential customers in Cleveland, Akron, as well as the Greater Northeast and Greater Northwest, Ohio can easily become infested with bed bugs. 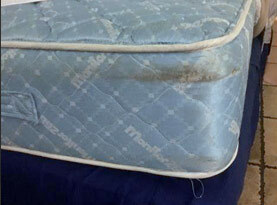 With their tiny stature, drive for human blood, and stealthy ability, bed bugs are capable of slipping into your home via luggage, daily totes such as purses or briefcases, second hand furniture, or simply on the folds of your clothes when visiting an infested commercial building or a residential home. It’s a myth that bed bugs only infest dirty, unkempt homes. They are found in the most pristine residences and high end hotels! Unless you perform a thorough check each and every time you return home, you can bring bed bugs home with you. Thankfully, Bed Bug Free offers a wide range of bed bug services including; Consultations, Education Services, Visual Inspection Service, Canine Inspection Service, Heat Exterminating Treatments, Chemical Exterminating Treatments, Prevention Services, Detection and Removal Services. Bed Bug Free’s consultation services for homeowners and business owners of Ohio including Cleveland, Akron, as well as the Greater Northeast and Greater Northwest areas are beneficial to help our customers better understand our company’s custom approach to dealing with bed bugs. You will have the opportunity to ask all the questions you have regarding bed bugs and pricing, as well as gain a better understanding of how our inspection and extermination services are performed, as well as any other questions you have. Bed Bug Free wants to educate our customers to help you understand the process, feel confident in our abilities, and prevent bed bugs from invading your home again in the future! Bed Bug Free inspections services are performed by either experienced experts conducting a thorough visual inspection or a certified K9 bed bug inspection team consisting of a handler and canine counterpart. Both inspectors, human and canine, are expertly trained and knowledgeable in regards to the areas bed bugs can be hiding; which is nearly anywhere. 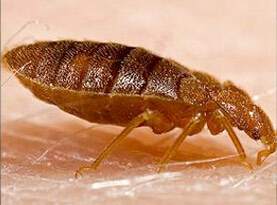 Bed Bug Free’s visual inspection service is executed by a highly trained and experienced professional. Searching for bed bugs thoroughly from room to room to ensure treatments are efficiently applied. Bed Bug Free’s Canine inspection Service is fast and effective. 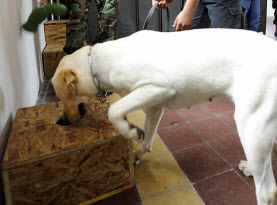 With a certified trained canine and handler team performing the inspection, the dogs routinely inspect the building in search of bed bugs and their viable eggs. Bed Bug Free also offers effective extermination treatment services include heat, with the use of gas or electric powered heat assistance and/or chemical application to homes or businesses. With limited customer preparation, our experts can ensure proper treatment application. All we ask from our valued customers is to remove excess clutter. Or bed bug extermination service includes the general areas of the building as well as treating the cracks, crevices, and even breaking down the beds to ensure blood hungry bed bugs are all tracked and exterminated. If you suspect bed bugs in your home or business in Cleveland, Akron, as well as the Greater Northeast and Greater Northwest, Ohio contact Bed Bug Free today and we can set you up with any of our bed bug services.